Repair Kits are available for all of the DWD Air Poppets. The STANDARD REPAIR KITS come as a package of (10) springs and (10) cross-pins. 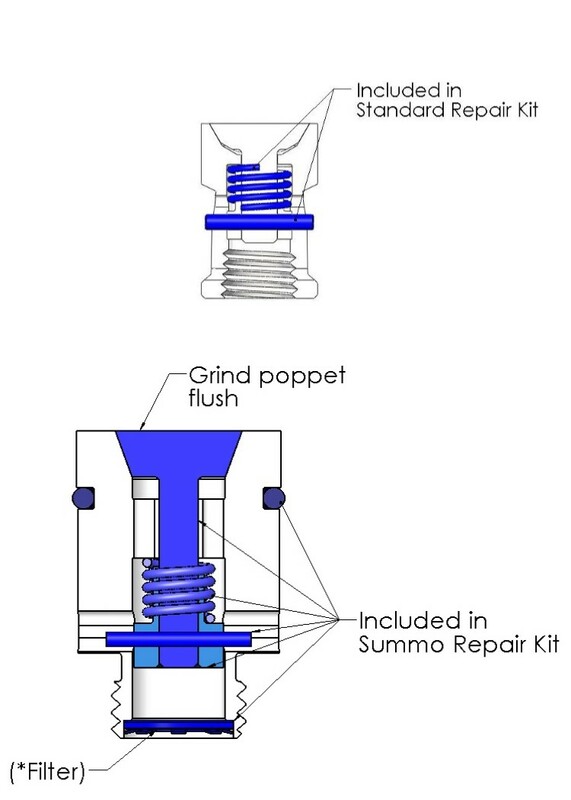 The SUMMO REPAIR KIT contains a new poppet valve, spring, cross-pin, sleeve, o-ring, replacement filter and retainer ring, enough to repair (1) SUMMO Poppet. Note that the SUMMO Poppet valve will be long by approximately .005"-.015" and will need to be ground flush with the existing SUMMO body. Note also that the filter will need to be removed from the back of a SUMMO Poppet before the repair kit can be installed. A special SUMMO JACK tool is available to aid in preloading the spring for easier cross pin installation and removal.